Boston Baroque’s nearly-all-Beethoven concert under the direction of Martin Pearlman featured works from the composer’s young years in Vienna, beginning with the overture to the ballet, “The Creatures of Prometheus,” and culminating in the triumphant Fifth Symphony. The performance on Friday, March 4th at New England Conservatory’s Jordan Hall was repeated on Saturday; this reviewer attended on Friday. The “Prometheus” ballet was commissioned in 1800 and premiered at the court theater in Vienna in March of 1801, its hero not the rebellious Titan punished by Zeus, but rather an Enlightenment philosopher who exposes humankind to the higher arts and sciences. Beginning, like the First Symphony, with an unstable seventh chord, the dramatic and dissonant opening of the slow introduction is answered by a sweetly consonant C-major theme doubled by oboes and horns, another fortissimo climax, and the sudden, hushed entry of a bustling Allegro molto con brio in the violins. The overture became popular in its own right and helped establish Beethoven’s reputation as an orchestral composer on the level of Haydn and Mozart. Pearlman and the Boston Baroque players on period instruments carried off this joyful opening with appropriate panache. In 1795, toward the end of his second stay in London, Haydn composed the Scena di Berenice for the prima donna Brigitta Giorgi Banti to be performed, along with his Symphony No. 104, at a benefit concert of his works held on May 4th. Although the concert was a success, apparently the soprano was not up to the demands of this wide-ranging concert aria, and Haydn was disappointed. A cantata-like succession of accompanied recitative, arioso, and aria, it comprises a single scene from the opera Antigono to a libretto by Pietro Metastasio that had already been set by a number of composers. Berenice, queen of Egypt, is in love with Demetrio, prince of Macedonia, but for reasons of state agrees to marry Antigono and let Demetrio to be executed. The scena depicts her emotional turmoil at the dilemma posed by this classical Enlightenment conflict between love and duty. The performance by Romanian-born soprano Ana Maria Labin, making her Boston Baroque debut, would not have failed to please Haydn. With bell-like low tones and thrilling high notes, Labin’s intonation was absolutely sure even when a carefully-controlled vibrato was brought into play. A dramatic soprano exuding expressive power in the long recitatives supported by orchestral punctuation, she shifted from wild disbelief into agonized pleading, first in arioso style, then in a smoothly lyrical aria with horn obbligato, only to approach mad delirium in yet another accompanied recitative. Her final aria, two stanzas of furioso bravura, displayed the talents of an artist well schooled in the intricacies of Baroque ornamentation. In 1796, less than a year after the first performance of his teacher Haydn’s Scena di Berenice, Beethoven composed his own concert aria, “Ah! perfido,” on another Metastasio text depicting a similar dilemma: a woman who has been deserted by her lover vacillates between asking the gods to punish him and begging them to show him mercy. Early that year Beethoven had embarked on a tour to Prague, Dresden, Leipzig, and Berlin that lasted for six months. The aria was composed in Prague and dedicated to Countess Josephine de Clary, an amateur singer and a patron. It was probably intended, however, for Josefa Dussek, a soprano admired by Mozart, who had also written a concert aria for her. It was Dussek who gave the first performance of Beethoven’s aria in Leipzig. “Ah! perfido” was published in Vienna in 1805, and included in the program of Beethoven’s famous benefit concert in Vienna 1808 at which both the Fifth and the Sixth Symphonies received their premieres. Back on stage for the performance of “Ah! perfido,” Labin reappeared transformed: from a naive young princess in demure pastel to a vengeful wronged woman in sequined black. In Beethoven’s accompanied recitative setting, Metastasio’s lines are segmented in passages departing from an initial stentorian C Major through unstable minor-tinged harmonies and multiple alternations of fast and slow tempos representing the woman’s vengeful fury until, in a sudden reversal, she begs the gods to spare him. Labin played these vacillating outbursts to the hilt before settling into a lyrical E-flat, Adagio, for the Aria in which she turns to address her lover himself. Her stunning performance concluded with more bravura in swooping arpeggios and breathtaking descending chromatic scales on the word “pietà” (pity). 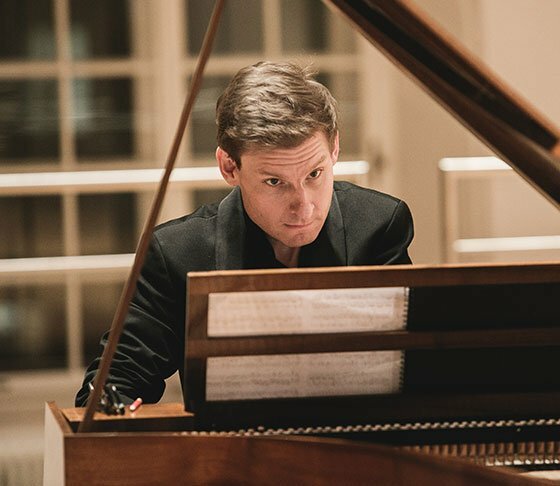 Fortepianist Kristian Bezuidenhout is certainly not unknown to local audiences, who have heard him play in Boston and Cambridge and may be familiar with his prizewinning recordings of Mozart keyboard music. This was the first time, however, that he has played with Boston Baroque. Beethoven’s early Concerto No. 2 in B-flat Major was an ideal vehicle for Bezuidenhout’s formidable skills, both as an ensemble player whose rapport with members of the orchestra is apparent, and as a soloist whose natural grace and sensitivity to melodic structure brings every phrase to life. Beethoven drafted the B-flat Major concerto between 1787 and 1789 for performance with the Bonn court orchestra, took it with him when he left for Vienna in November, 1792, performed it in March 1795, made final revisions in 1798, and published it in 1801. His next concerto, in C major, had already been published as Concerto No. 1, and a third, in C Minor, was published in 1804. He was now known not only as a piano virtuoso but as a leading composer of piano concertos, which he typically published only after he had already performed them himself. The early B-flat Major concerto is very much in the Mozartian tradition of elegant structure and sparkling virtuosity that was designed to captivate audiences. Like Mozart, Beethoven improvised his cadenzas at his own performances, although by 1809 he had written out a cadenza for the first movement of Concerto No. 2, perhaps for performance by a pupil. Bezuidenhout chose to improvise his own cadenza, alternating introspective musings on thematic material with dizzying virtuosic display. The second movement, Adagio, offered a different kind of virtuosity: the ornamentation of a singing line with complex arabesques while maintaining melodic coherence throughout. The Finale is a Rondo Molto allegro in 6/8, with incessant staccato and offbeat accents, all at lightning speed. Here the beauties of the fortepiano by Maine master builder Rodney Regier came to the fore: clarity in the bass and crisp, flutey sound in the topmost register were particularly striking. Bezuidenhout’s sureness of touch and precise rhythmic control concluded a memorable performance in high style. Plagued by increasing deafness, Beethoven surmounted the crisis of despair famously documented in the Heiligenstadt Testament of 1802. In 1804 he sketched a plan for the Symphony No. 5 in C Minor, opus 67, completed it in early 1808, and followed it soon afterwards with another symphony, the Sixth. Produced in quick succession, the two symphonies were dedicated jointly to his patrons, Prince Lobkowitz and Count Razumovsky, and both were premiered, along with the Piano Concerto No. 4, at the benefit concert on December 22nd. As Pearlman pointed out in brief remarks before the performance, while there have been many electrifying renditions of the Fifth Symphony by modern orchestras, only a performance on instruments of Beethoven’s time (or replicas thereof) can demonstrate how Beethoven pushed his players to their limits in terms of register and power. The players of the Boston Baroque orchestra are all highly accomplished solo and ensemble musicians, and Pearlman did indeed push them with a high sense of urgency and excitement. Sometimes, particularly in fast tempos, this very energy led to raggedness around the edges, marring the precision expected from this ensemble and demanded by the quick succession of motives in the first movement. After a slightly diffuse start, the second movement, Andante con moto, settled into a leisurely double variation of a gently lyrical theme in A-flat Major set against a blaring tutti in the jarring key of C Major. Under Pearlman’s direction, the transition in the winds, dolce, back to the final fortissimo statement of the C-major theme was particularly lovely. In the Scherzo, a ghostly reminiscence of a dance, a rising C-minor arpeggio emerges from the bottom to the top of the string section, only to be answered by an insistent, fortissimo version of the first movement opening motto. These two ideas maintain their dialogue throughout a development and varied recapitulation. In the Trio, in major, an antic fugato in rustic mode brings another mood entirely. Here the pointed, even pointillistic nature of the comic motive in the strings failed to come across. The drama of expectation, on the other hand, as rhythmic and harmonic motion were suspended in the transition to the Finale, was beautifully executed. In the Finale itself, with the orchestra expanded to include piccolo, trombones, and contrabassoon, the resolution of thematic and tonal conflicts (including the mysterious return of the Scherzo version of the motto theme, pizzicato, at the end of the development) pushed all the participants to their limits in a triumphant reaffirmation of C Major.